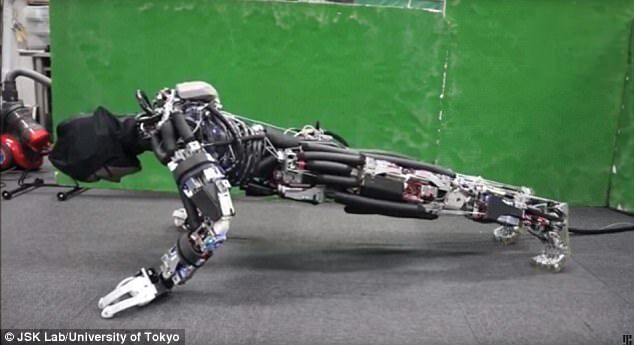 Engineers in Japan have turned to human body for inspiration for a pair of robots capable of performing a range of incredibly life-like movements. Instead of seeking perfection, experts recreated the intricacies of the skeleton and its surrounding tissue, with all the imperfections that entails. 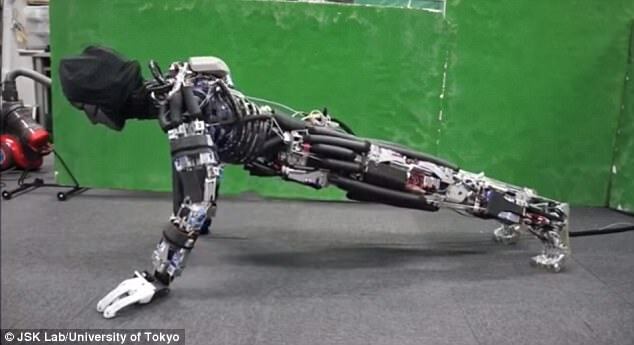 The result is machines that sweats while doing push ups, playing badminton and other complicated motions in a less mechanical manner than most automatons. 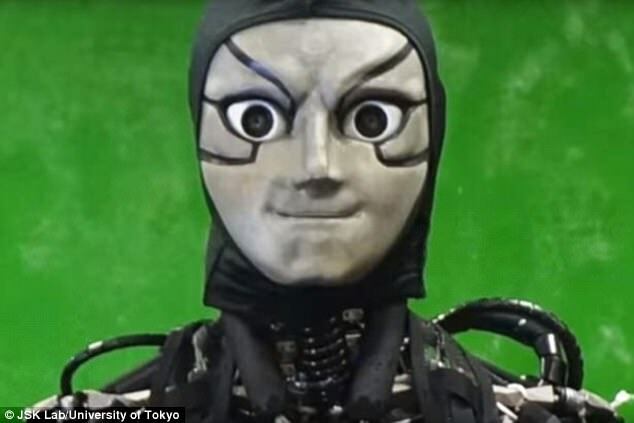 Researchers at the University of Tokyo built two models of the humanoids, called Kengoro and Kenshiro, recreating the entire musculoskeletal system. They used aluminium, steel and plastic as a frame, and designed synthetic joints and ligaments to enable the robots to move. The pair have rib cages and flexible spines, as well as an artificial central nervous system that monitors balance and stability. Kengoro and Kenshiro have also been equipped with high tech processing power to give them the ability to act and react independently. 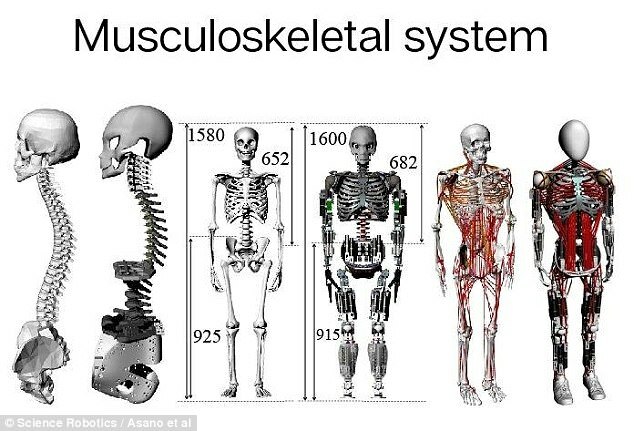 In a paper published in the journal Science Robotics, lead researcher Yuki Asano said: 'For at least the last two millennia, human beings have endeavoured to understand the systems and mechanisms that make up the human body. 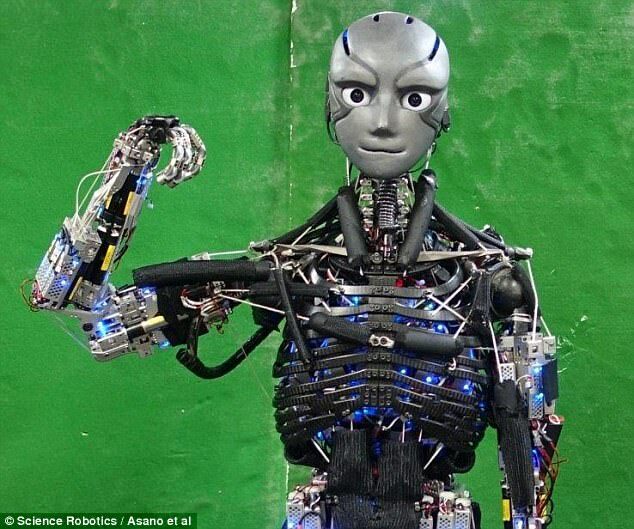 'However, a limitation of conventional humanoids is that they have been designed on the basis of the theories of conventional engineering, mechanics, electronics, and informatics. 'By contrast, our intent is to design a humanoid based on human systems, including the musculoskeletal structure, sensory nervous system, and methods of information processing in the brain. 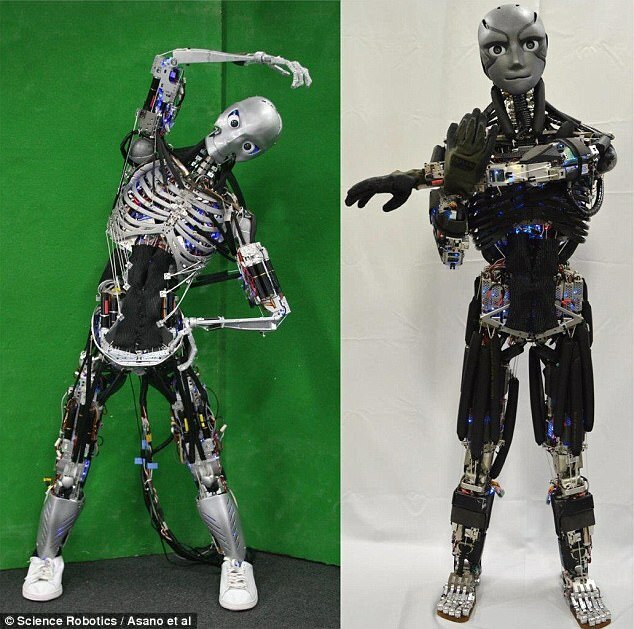 'Our research team has successfully developed musculoskeletal robots. University of Tokyo lab's first hit the headlines last year, with Kengoro making the news last year for its ability to sweat. This is not the first time that the University of Tokyo lab's work has hit the headlines, with Kengoro making the news last year for its ability to sweat. The bones were designed with a porous layers that retain water. As water releases from a pump in the inner porous layer, it travels to a more porous region near the surface of the frame – here it will then evaporate, instead of leaking onto the floor. One cup of deionized water can keep Kengoro powered for half of the day without overheating and it can do push-ups for 11 minutes straight. Kengoro's skeletal structure is designed to let water seep through porous layers in its frame, which eventually evaporates to cool its 180 motors. The robot 'sweats' in order to stay cool, allowing it do push-ups for 11 minutes straight without burning out its motors. 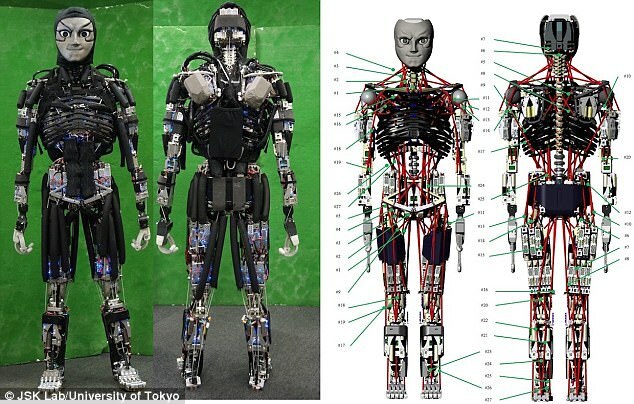 The University of Tokyo team were searching for a strategic way to add a cooling system to their 123 pound, 5 foot 7 inch tall humanoid. However, this robot was already 'stuffed to the brim with structural components, circuit boards, gears and motors', making it impossible to make room to add an active water cooling system. The team realized the robot's structure could be modified to function as the entire system in a way that would cool it down similar to human skin. 'Usually the frame of a robot is only used to support forces,' lead author Toyotaka Kozuki told IEEE Spectrum in an interview. 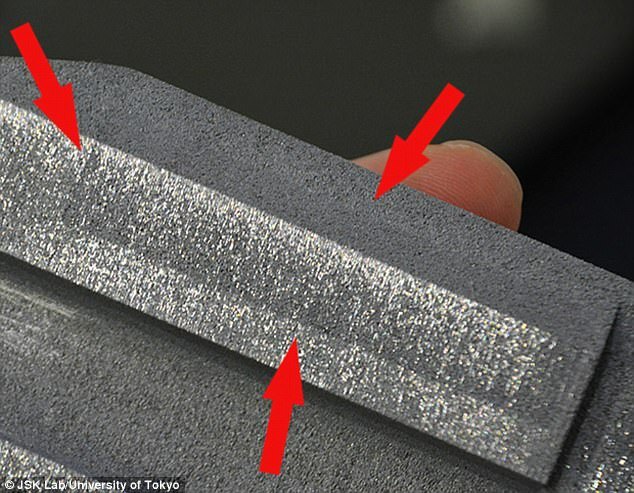 Kengoro's skeleton, or metal frame, is made of aluminum and each 'bone' was printed using a laser that sintered the powered metal, reports Evan Ackerman with IEEE. This process lets developers select the permeability of the metal, as some parts of this humanoid are solid and others are similar to a sponge. The bones were designed with a porous honeycomb-like layers that retain water. Water is released when the robot is working hard and begins to overheat. As water releases from a pump in the inner porous layer of the 'bones', it travels to a more porous region near the surface of the frame – here it evaporates, instead of leaking onto the floor. But just like humans, this robot needs to keep itself hydrated for the cooling system to function properly. The researchers found that this new human-like system works three times better than air cooling and significantly better than just circulating water through the interior channel. However, the team says it is not as effective as using traditional radiators or fans, which is found in many machines.